You are here: Home › Beauty › BEST OF 2014: Mommy & Kids PLUS HUGE GIVEAWAYS!!! So excited to finally post another Best of 2014 video of all my ultimate favorites from last year for myself and my family! Not only am I sharing my best of 2014 but my fellow mommy friends on You Tube are too! And we each are hosting our own individual giveaways on each of our channels!!! You are not required to subscribe to every single one of us to enter each giveaway but I highly recommend that you check out their channel and videos since they are all moms I follow and are friends with! What were some of your faves in 2014 and have you tried any of the products I recommended? Enter my giveaway below on Rafflecopter or click here. Please check out all of my friends channels below and enter their giveaways too! – Beachbody 21 Day Fix Order through me here. – Shakeology Vanilla Flavor Order through me here. * Best women’s fashion subscription Just Fab Get a discount with my link here. * Best kid’s fashion subscription Fab Kids Get a discount with my link here. – Stella Dot Engravables Order through me here or ask how you can host your own virtual party to get free products. – Tula skincare My current skincare routine video. Check out my 7 friends video links below to see their Best of 2014 products and enter their individual GIVEAWAYS!!! 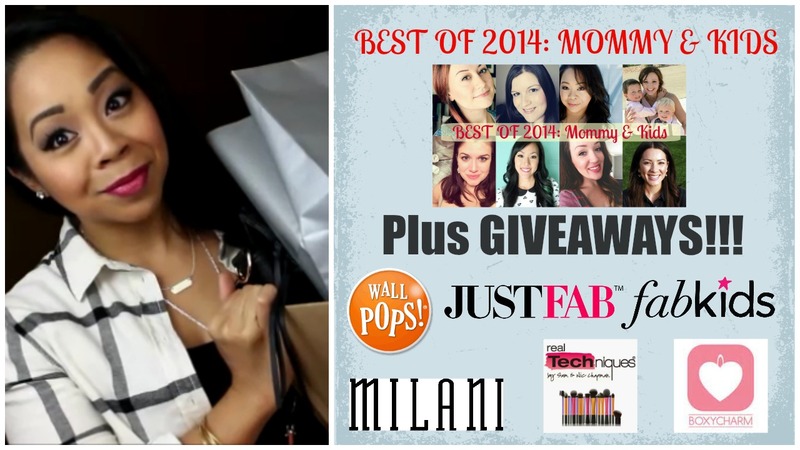 25 Responses to "BEST OF 2014: Mommy & Kids PLUS HUGE GIVEAWAYS!!!" I’m most excited for the Too Faced chocolate soleil bronzer! i feel i will get lots of use out of all of these items! I would love to try some Real Techniques stuff. Thank so much for the chance to win these great items. Thanks for the giveaway! Always great to find talented Youtubers! As for the giveaway, I’m excited for the calendar… as for things I’d love to purchase, I’d love to try the 21 Day Fix. It seems like a real life style change. Oh and the I’ve always wanted to try the Real Techniques brushes! Love the video, gotta try the wet brush! awesome giveaway!! 21 day fix sounds like something i want to try! Excited about the brush set giveaway! So neat! Thanks for doing the giveaway. love ur favourites. like win a calendar. erin condren is my fav too. I am most excited about the Boxycharm. Omg wow!! Incredible giveaway!! Everything is so so amazing! I think I’m most excited for the Real Techniques brushes and the Boxy Charm. U WANT TO TRY THE 21 DAY CHALLENGE…MY BIGGEST STRUGGLE IS MY FOOD INTAKE. Love to try just fab! I want to try the fabkids most the organizer is awesome too! love everything though. SO awesome!! I love so many of the items. The stainless steel oven mitt is unique. Having three girls, I love the Fab Kids subscription. Thanks so much for the giveaway! I’m most excited for the Milani lipsticks! i’m excited for the calender, i need organization in my life! also, the brushes! Would love to try 21 day fix!